Join Us!!! We are looking for someone to help us cover Nepalese basketball. Please send us an e-mail. In the 5th South Asian Basketball Association (SABA) Championship underway in Maldives, India beat Nepal 90-44 to go unbeaten in the tournament and complete a historic five-peat of SABA championships. Playing its fourth and final round robin encounter, defending champs India dominated Nepal 90-44 and earned yet another victory. India made the most of its size advantage against a smaller Nepal team and scored majority of its points in the paint while opening a 19-point lead in the very first quarter. India's veteran shooting guard Vishesh Bhriguvanshi (192-G-91) continued his scoring spree as he tallied 22 points in the encounter. Shooting guard Anil Kumar BK also chipped in with 16 points off the bench. The second half of the game saw young players Jeevanatham Pandi, Muin Bek and Vishal Kumar Gupta get some valuable playing time. Pandi made the most of this opportunity by using his size to grab offensive rebounds and score 12 points for the team. For Nepal, Ashim Shrestha was the leading scorer with 9 points as Nepal's shooters struggled against India's zone defence. Vishesh Bhriguvanshi was declared player of the match while centre Amritpal Singh (212-C/F-91) won the MVP of the tournament. India has now ensured qualification for itself and its top club team, in the upcoming FIBA Asia Cup in Lebanon from 8-20 August, and the FIBA Asia Champions Cup respectively. 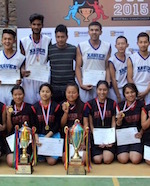 Hosts Prime College and Xavier International College lifted the title of boys' and girls' category respectively of the 2015 Prime Cup inter-college basketball tournament here at Kathmandu, Nepal. In the boys' final; Prime College defeated Xavier International College 40 - 32 (06-04, 14-04, 13-07, 07-14) with Suraj Khadgi netting 16 points for the hosts. While in the girls' final Xavier International College triumphed over Goldengate International College 39 - 33 (06-04, 13-06, 09-14, 11-10) to lift the title. 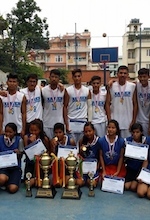 Nischal Maharjan of Prime College and Maya Rai of Xavier International College were judged the MVPs in the boys' and girls' categories respectively.